The Colorado rental agreements are written between a lessor and lessee to make a formal contract for the leasing of commercial or residential property. All documents must follow their respective Statutes, Residential Laws – Title 38 > Article 12 and Commercial Laws – Title 4 > Article 2.5. It is recommended for all parties to come to a verbal agreement before writing and once complete with authorization the forms become legal. Rental Application – Used by a landlord to check the tenant’s current and past: employer(s), lessor(s), and to verify their credit. Commercial Lease Agreement – For the use of any type of non-residential property including but not limited to land, office, retail, industrial, and storage space. Lease with Option to Purchase (Lease to Own) – Standard residential lease template with the added option of being able to purchase the premises. Month to Month Lease Agreement – Known as a tenancy at will, allows the tenant and landlord to have a basic rental arrangement with no end date. The contract is canceled by sending notice to the other party. Room Rental (Roommate) Agreement – Contract amongst roommates to clarify payment, cleaning, and everyday responsibilities of the rental unit. Standard Lease Agreement – Fixed term arrangement with a start and end date. Typically for one (1) year. 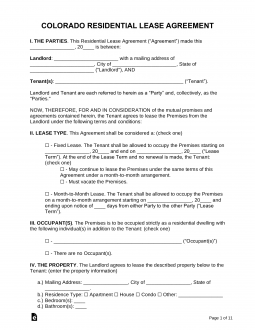 Sublease Agreement – Allows a subtenant, with the written consent of the landlord, to take over another’s lease. Termination Lease Letter (Notice to Quit) – Allows a landlord to cancel a tenant’s lease for a general termination of a tenancy at will. The time period for canceling depends on the amount of time the tenant was on the property and the specified lease type (see Section 13-40-107). Colorado does not have any required State disclosures to be attached to any rental contract. There are no rules set by the State but the landlord is always recommended to give the tenant reasonable notice. Lead Paint Disclosure – Federal law required for any housing structure built prior to 1978. Returning (§ 38-12-103 & § 38-12-104) – Landlord must send payment within one (1) month if the lease does not mention a return timetable. If the lease does mention a return range it cannot be more than sixty (60) days. If the lease was broken due to a hazardous condition because of gas equipment tenant should receive their money within seventy-two (72) hours.